What causes aches and pains in our back, neck, legs, arms, head and joints? What is the source of these problems that can become so detrimental to our quality of life? Why live with pain as so many of us do? Many of these problems can be associated with the imbalance of the spinal column. The spinal column is a tunnel of interlocking bones called vertebrae that protect the spinal cord. The spinal cord is an extension of the brain, together known as the central nervous system. There are spaces between each vertebra allowing nerves, which are extensions of the spinal cord, to supply and connect every part of the human body. Therefore, it is the nervous system that regulates and affects all body functions. The nervous system can be likened to a major super highway. Without problems and all vehicles going the speed limit, travel is smooth and without accident. However, if there is a car crash, traffic slows down and even stops. The highway does not function as it was intended. When the spinal column is misaligned and out of balance, the nervous system is unable to function as it was intended. Many years of clinical research points to the fact that much of the problem associated with spinal misalignment and its consequences can be associated with the atlas vertebra, the top cervical bone in the neck. This one bone can effect the alignment of the entire spine. The spine is like a chain-when the first link is twisted and turned, each link down to the last turns-thereby disrupting the rest of the chain. Consider the atlas the first and therefore the most important link in that chain. The human body is balanced when the head is positioned in the center of the feet. When the atlas is misaligned it causes the head to tilt. The spine then shifts to support the weight of the head, thereby creating biomechanical and postural stresses and strains. When the atlas bone is properly aligned, that is in the orthogonal-or neutral-position, the rest of the spinal vertebra come into better alignment allowing the body to heal itself. The delicate and complex connections of the nervous system allow communication between the systems of the body. An examination of the anatomy of the atlas vertebra reveals that it weighs a mere two ounces and the human head weighs 9 to 17 pounds. Hence, the likeness to ATLAS, the figure in Greek mythology who carried the world on his shoulders. The atlas is located directly under the head, connecting the head to the rest of the spine. The atlas supports the weight of the head most efficiently in the orthogonal, or neutral position. Atlas orthogonal is an engineering term referring to the position of the atlas being 90 degrees to the head and neck. Trauma in one form or another is the primary cause of misalignment. When the atlas vertebra is subjected to stresses and strains, it may be pushed out of proper alignment. Trauma may include car accidents (no matter how minor and regardless of immediate symptoms), slips and falls, blows to the head, or sports related injuries. Repetitive micro traumas, such as bad sleeping habits, poor posture, incorrect lifting and carrying can also cause misalignment. Once the atlas is moved out of its orthogonal position the body tries to compensate to maintain its center of gravity. It does this by keeping the head directly over the center of the feet. However to maintain the level position of the head the rest of the spine adapts and is thrown out of alignment. The body alters its structure in such a way that the muscles contract to cause one leg to appear shorter. In most cases one leg is not actually shorter than the other, but is drawn short due to the body's compensation for the displaced atlas. The resulting misalignment may cause nerve pressure and inflammation causing a disruption of the normal functioning of the nervous system. This one dysfunction may play a role in a multitude of symptoms and pain in different areas of the body. Besides directly impacting the neck, we can see other effects such as decreased curves in the neck, scoliosis, and changes in the alignment in the shoulders and pelvis. These changes in the alignment affect the structural integrity of the skeletal system. This in turn can result in a host of other symptoms and problems, especially headaches, neck, and facial pain. An atlas orthogonist treats this condition through a system of examination and diagnosis that utilizes a detailed scientific and biomechanical protocol. Precise measurements of the angle of the atlas are the basis of the treatments. An extensive evaluation of the patient condition is rendered by the doctor on the first visit. A complete and thorough history is critical in aiding the doctor in the proper diagnosis. This history includes asking a variety of questions pertaining to every aspect of the patients symptoms and injuries. The exam also includes orthopedic/neurologic, and postural assessment of imbalances in the spine that would lead to problems with the health of the spine and its related symptoms and pain. The first step of the diagnosis is to determine the degree in which the atlas is misaligned. Very precise x-rays are taken which show the doctor exactly how the atlas is displaced. The x-rays taken are invaluable in making the most precise atlas correction which is as unique to the patient as their own fingerprint. Following the diagnosis a specific treatment protocol is developed to align the atlas into the correct neutral/orthogonal position. One of the most important post adjustment steps are post x-rays, which are taken immediately after the initial treatments. There is no guess work in this program. These three dimensional x-rays are taken and analyzed to verify that the best possible correction was rendered. The doctor may then show the patient the comparison between before and after x-rays. Post x-rays are an illustration of the exact change that has taken place because of the atlas orthogonal correction. In order to treat this condition, Dr. Roy Sweat, the founder of the atlas orthogonal procedure, devised a method using a percussion wave, which is a vibration to re-position the atlas vertebra. Dr. Sweat is considered by many to be one of the foremost authorities in the world on the cervical spine. Dr. Michlin was taught by Dr. Sweat, and he worked with Dr. Sweat for his externship. The history of treating the atlas goes back to the early 1900's when Dr. B.J. Palmer, the developer of chiropractic, spent many years of clinical research in discovering that it was the atlas that controlled the position of the head and the resulting position of the rest of the spine. Dr. Palmer taught to correct the atlas position using the hands with about 40 pounds of force. Dr. Sweat and Dr. John F. Grostic were taught by Dr. Palmer. In his extensive clinical research, Dr. Grostic found that much less force was actually necessary to correct the atlas into position. Dr. Sweat in his further research discovered that even less force was actually needed. Dr. Sweat invented and engineered a highly advanced instrument that without pain or pressure is able to accurately re-position the atlas vertebra. The procedure is non-invasive and gentle. Dr. Michlin is the only chiropractor in North Texas who is a Board Certified Atlas Orthogonist. The results from an atlas orthogonal adjustment are often immediate and dramatic. However, the atlas may have been out of alignment for some time before symptoms actually appear. Without proper treatment the symptoms only get worse, and the problem becomes more difficult to correct. The longer the existing condition is without treatment, the more time and treatment it may take to heal. 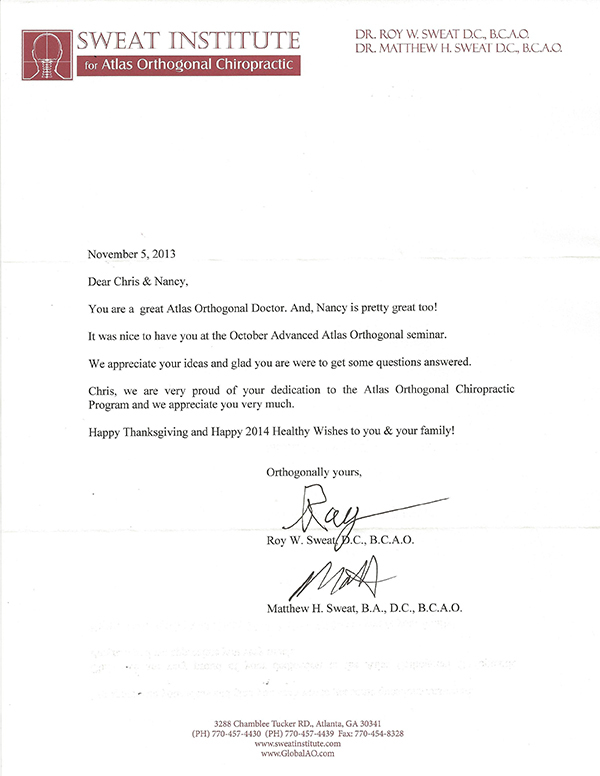 What great praise for Dr. Chris Michlin from Dr. Roy W. Sweat, the man who invented the Atlas Orthogonal Adjusting Instrument, and his son Dr. Matt Sweat. Dr. Michlin had the great opportunity of honing his adjusting techniques by working with the Sweats during his externship!